This project is indeed one born from necessity. One, I’m sick of my fridge being covered in photos. Two, picture frames are crazy expensive! We recently added four Ana White $10 ledges to our living room and I wanted a way to display all of my photos. It needed to be low-cost and I needed to be able to switch out my photos easily. I started with 3 barn wood frames from Hobby Lobby (purchased during a 50% off sale). I also picked up a roll of 1 inch chicken wire at Lowe’s. I bought a whole roll so I can use the rest to keep the chickens from digging up the garden beds and unearthing my Mulberry trees to dust bathe. The wire is super shiny silver so dug out a few cans of spray paint. 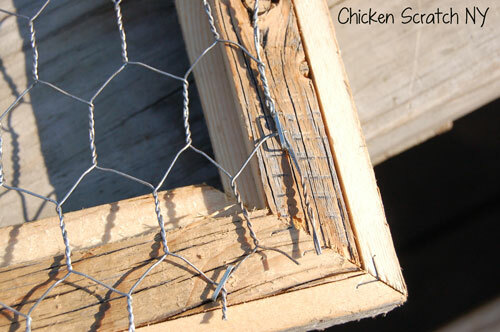 Start out by rolling out your chicken wire. 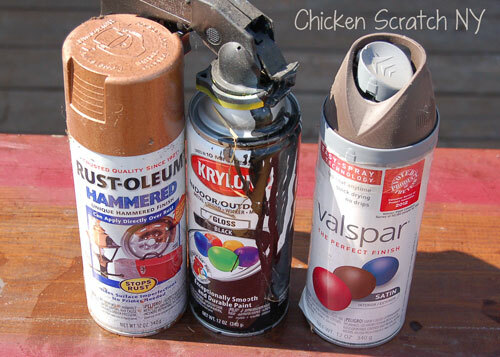 Lay out your frames so you know how much wire you need to paint and cut off the end piece. I have no idea what happend to the black paint, I do know my husband was involved. Several slow passes with the brown paint covered most of the wire, I randomly lightly misted with the black and copper spray paints to add some age and then added a few patches of more solid black and copper. It was really sunny out and I couldn’t really see what I was doing so I just went with it and hoped for the best. Lay your first frame face down, start by stapling in a corner and work your way around. 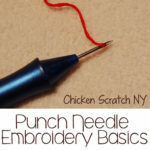 It’s pretty easy to warp the chicken wire so gently pull it taught and continue to staple. It can be tricky and there is a bit of a learning curve to stapling hex wire (we learned that when fixing up our “witness protection program”. After stapling use your wire cutters to clip the wire around the entire frame. Good cutters are worth their weight in gold. Our came from Lowe’s, they didn’t cost a lot more than a regular pair (under $20) but they make cutting so much easier. I stapled, then cut because the wire has a tendency to shift and once you cut it too small you have to start over. Repeat with the other frames. The small frame holds one or two pictures, the larger ones can each hold over a dozen depending on size. I used miniature clothes pins to hold my pictures up, I’m not 100% in love with the mini clips yet, I might give a few a quick stain to darken up the color similar to the shelves. the world would be a much sadder place 🙂 Thanks for stopping by! Great idea! I’d love for you to link up to The DIY’ers. Those are so cute! I will have to make them in my next house! Hi. This is so clever, I pinned it too. I had thoughts how this could be used outside in the garden and/or hanging on the house too to display ornaments. What a creative idea, I think this would make a cool board for hanging notes and memos as well. Looks like you had a lot of fun making these frames. That is so cool! You have the neatest crafts. I want to make these too! This is such a cute idea! This would be great to hang all of my kids projects on too! So cute! I wish I had a creative streak, but I’m hopeless. What an incredibly unique decor idea. I so love this!!!! I love this idea because it totally matches my home! We share the love for rustic, and primitive decor! What a great idea this is! I no longer have lots of “things” on my ‘fridge, but I sure wish I had thought of this 25 years ago! This is super unique! Great great tutorial! I have never seen a frame like this. Very creative idea. I love how it would break up the wall and vary the textures and colors. I love the photo and I love the frame. What a great use of chicken wire. Too cute! My sister-in-law would love this. I LOVE this frame. This would make a perfect gift too! I wish that I were more crafty, your frame turned out great. Love the antique quality of it! Thanks for sharing. 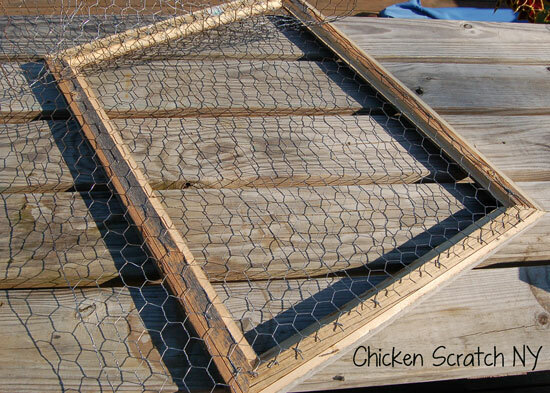 What an ingenious way to use chicken wire. Don’t think I’ll have the patience to do this though. I’d rather just run out and buy a cheap 99 cent frame at the dollar store. That looks awesome! 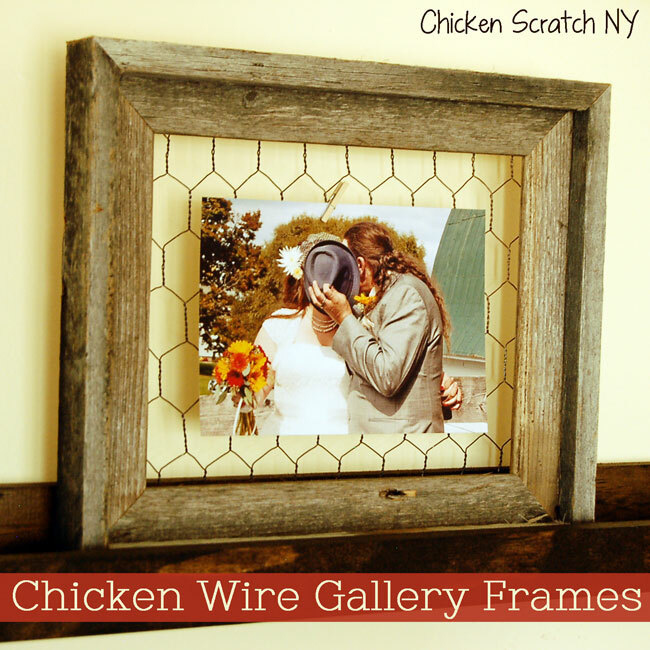 I have never thought to make my own chicken wire frame. This is such a nice and creative craft idea. I immediately thought of several things I could do with this great idea. 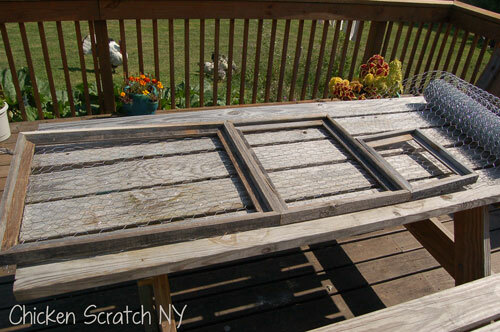 Love this ideal… I love DIY projects; makes things so personable. 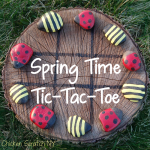 Very creative and crafty! So beautiful!